The goal of this book is to bring together into one accessible text the fundamentals of the many disciplines needed by today's engineer working in the field of microelectromechanical systems (MEMS). The subject matter is wide-ranging: microfabrication, mechanics, heat flow, electronics, noise, and dynamics of systems, with and without feedback. Because it is very difficult to enunciate principles of `good design' in the abstract, the book is organized around a set of Case Studies that are based on real products, or, where appropriately well-documented products could not be found, on thoroughly published prototype work. The Case Studies were selected to sample a multidimensional space: different manufacturing and fabrication methods, different device applications, and different physical effects used for transduction. The Case Study subjects are: the design and packaging of a piezoresistive pressure sensor, a capacitively-sensed accelerometer, a quartz piezoelectrically-driven and sensed rate gyroscope, two electrostatically-actuated optical projection displays, two microsystems for the amplification of DNA, and a catalytic sensor for combustible gases. 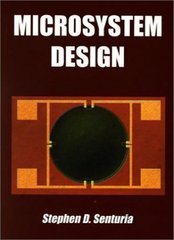 This book is used for a graduate course in `Design and Fabrication of Microelectromechanical Devices (MEMS)' at the Massachusetts Institute of Technology. It is appropriate for textbook use by senior/graduate courses in MEMS, and will be a useful reference for the active MEMS professional. Each chapter is supplemented with homework problems and suggested related reading. In addition, the book is supported by a web site that will include additional homework exercises, suggested design problems and related teaching materials, and software used in the textbook examples and homework problems.